Fabric Paper Thread: Happy Thanksgiving! The turkey is roasting in the oven. For now, the house is quiet. But in an hour or so, it will be filled with the sounds of people talking and laughing, and the chatter of little girls. The table is set with a warmly colored runner, red napkins and a few fall leaves. Candles, of course. The Give Thanks tag was on the centerpiece of yesterday's Thanksgiving dinner, hosted by our eldest daughter and her husband for the "other side" of the family. Unfortunately, some of their number were ill and unable to attend, so we were invited to help swell the numbers. I don't mind two turkey dinners on Thanksgiving weekend! Little Miss A spied these two mini-pumpkins at my house the other day. "Please, Nana," she said, "can I hold one?" She carried it carefully around the house and said in the most heartfelt tone, "Thank you, Nana, for sharing your pumpkins with me." Then, later, "they are SO cute." When Little Miss S showed up, she needed a pumpkin, too. Such cute little pumpkins themselves, they are. We're doing things a little bit differently this year. Soup and salad will be served beforehand, but not at the table. We'll feed the little girls and eat Asian Summer Rolls while we do so, and sip Garlic Leek Soup from cups. Then, after the little ones are in bed, and hopefully asleep, we'll sit down and enjoy the rest of the meal. The parents are looking forward to a meal of adult conversation and relative quiet. We'll see how that turns out. I know that only Canada celebrates Thanksgiving this particular weekend, and that much of the world doesn't have a particular day to give thanks. It should be a regular part of life, anyway. Today I express my thanks to you, my readers, for the friendships you offer, the comments you make, the lessons you teach, and the inspiration you are to me. Linking with Mary for Mosaic Monday. Looks so warm and cozy at your house. Get back to us how your plans worked! Happy Thanksgiving to you! I love your table runner, I have some fabric leftover from a runner I made and think I'll try to make another one like yours. How interesting to eat after the children go to bed. Can't wait to hear how that goes! Could be a wonderful new tradition. Happy Thanksgiving! What a blessing to have family close by to share your special meals. I love that pretty table runner. I would love to try to make one! Enjoy the special weekend! Sweet hugs! Your table runner is lovely, it all looks festive, and of course those grands are just adorable! I hope your plans for an adult dinner worked out! Happy Thanksgiving, Lorrie! I love your quilted table runner and the nature-themed centerpiece. It all looks wonderful. Your granddaughters are such darlings -- they're adorable! :) You must love spending time with them. I agree it's wonderful to have a national holiday to celebrate the blessings we are thankful for. I hope you have a great week. Your table is beautiful, Lorrie, and the little ones are adorable playing with the pumpkins. Happy Thanksgiving to all in your home. Your table runner is pretty under the centrepiece. The small pumpkins were the perfect size for the little hands to carry and examine. Hope your adult dinner was enjoyable. What lovely photos, and the girls are simply charming. Happy Thanksgiving - we have a month to go until we have ours, which is only 3 weeks and 6 days before christmas this year. I wish it was in October like Canada - much more sensible. 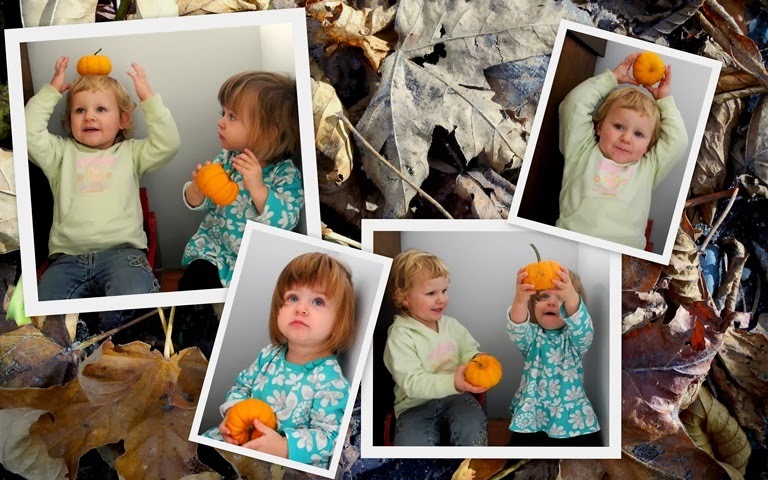 I agree, you two little grandbabies are the cutest little pumpkins around! I hope you enjoy your "adult" dinner when the little ones are in bed! Happy Thanksgiving Lorrie! Your table runner is beautiful all your little pumpkins are as cute as can be. Happy Thanksgiving, Lorrie. Your table runner is just beautiful Lorrie. Love the the little pumpkins...all of them! Happy thanksgiving Lorrie. Your table looks beautiful - what a great idea it would be if we all gave thanks every day but also had a special day to celebrate too. Sadly here in UK we don't do that. Hope your little pumpkins enjoyed their day and that the adults had a peaceful celebration too. 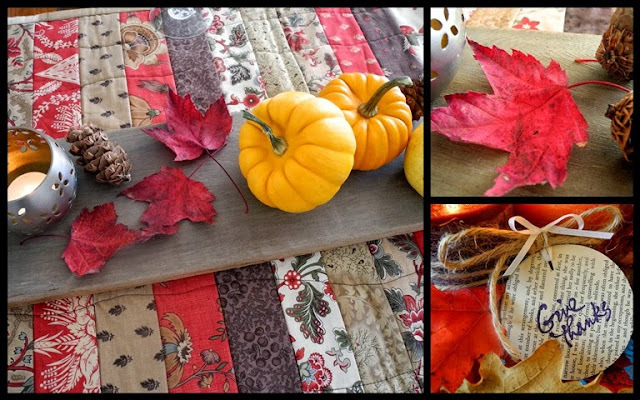 I think everyone else has said it....but, I do like your table runner, it looks perfect for an Autumn Thanksgiving. Happy Thanksgiving to you and your family! Looks like a happy celebration with your family. Enjoy your week ahead! Beautiful , happy thankgiving table and everything ! It's looking beautiful over there...and I can smell the turkey from here. Have a blessed Thanksgiving Day! I love the quilted runner! I hope you had a wonderful Thanksgiving! What a beautiful Thanksgiving table and quilt. And yes, adorable pumpkins - all of them. Happy Thanksgiving to you and yours! I hope your Thanksgiving went off in style and everyone was happy. The little ones certainly look happy. And a Happy Thanksgiving to you as well! Aren't we fortunate Nanas! Happy Thanksgiving a little late. Such sweet little ones and what a good idea for tucking them in bed and enjoying the adult conversation. Happy Thanksgiving to you too. Sounds like a lovely dinner, and everyone will get to enjoy it. I love the idea of the soup before hand. Happy Thanksgiving to you! I agree that it is a wonderful holiday, reminding us to give thanks for our many blessings. I love your table runner and the decorated wood board. And the little ones are just precious. I laughed when I saw the photo of the pumpkin balancing on a head! I love you idea of adults having appetizers while the kids eat. Our gands are getting older, but there are times I love the dinner conversations when they are off playing... so I plan to do that tomorrow when we have our turkey. I have butternut soup ready and I think I'll take your suggestion to let the adults sip on it in mugs while the kids eat. What a beautiful and interesting blog you have made. I will be back.